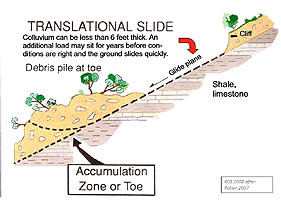 A common mechanism of landslide movement in the Cincinnati area is by translation. That is, the slide moves downhill in a straight line along a flat surface. This style of movement is common in soils developed on the Kope Formation, where they detach at the base of the soil. Examples are Delhi Pike and Columbia Parkway.